It's easy to see why this sumptuous home has been up for numerous awards. 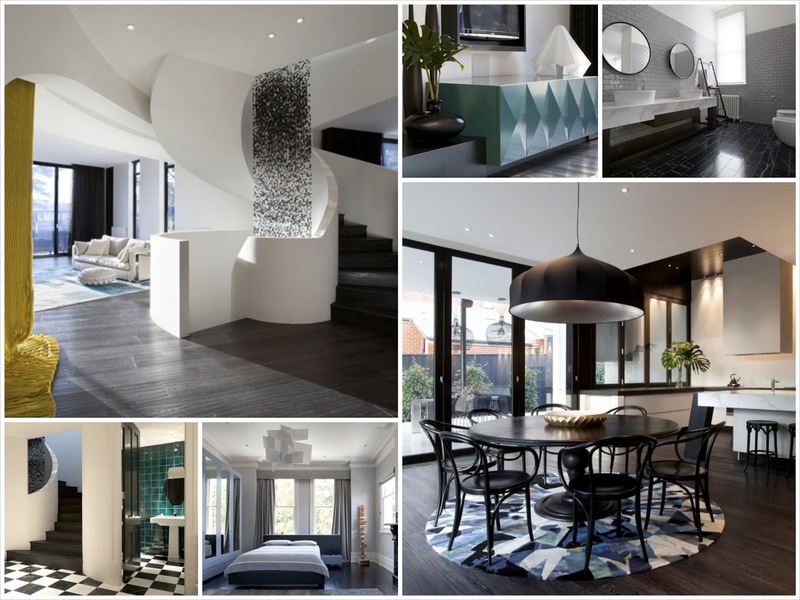 Shortlisted last year for national awards and now competing in the residential interior design category in the upcoming 2013 Melbourne Design Awards, Barry Street Residence, a major renovation and extension to an original grand old Victorian home in Kew, Melbourne, is a super luxe home. The interior design is by Australian studio caia_di_lizio design, a collaborative effort between the talented Nicolina Caia and Tania di Lizio. The designers describe the material and colour palette as a range of textured monochromatic finishes invigorated by punctuations of colour. They selected neutral white walls to offset the deep warmth and richness of the natural materials and to enhance the sculptural qualities of the space. Colour was used to intensify particular areas, such as a massive yellow curtain between the kitchen and the living room, the teal blue door leading from the old part of the house to the new, the sea green tiles of the basement powder room and teal blue carpet in the library.